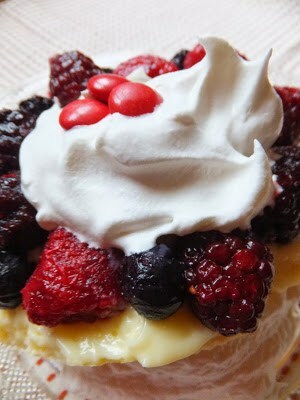 Berries on a Cloud is my twist on the famous dessert, Pavlova. This dessert makes two nice size Pavaloa, one for you and one for your honey. 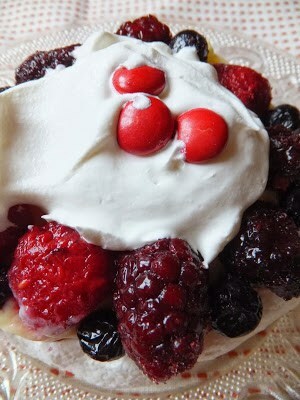 Berries on a Cloud is basically a large meringue “cloud” that is topped with an instant sugar-free lemon pudding mix, (or you can make from scratch pudding) then topped with frozen mixed berries that have been allowed to thaw. Whipped topping and a few chocolate candies add the crowning touch. Pavalova should not be confused with the another famous dessert, Schaum Torte. 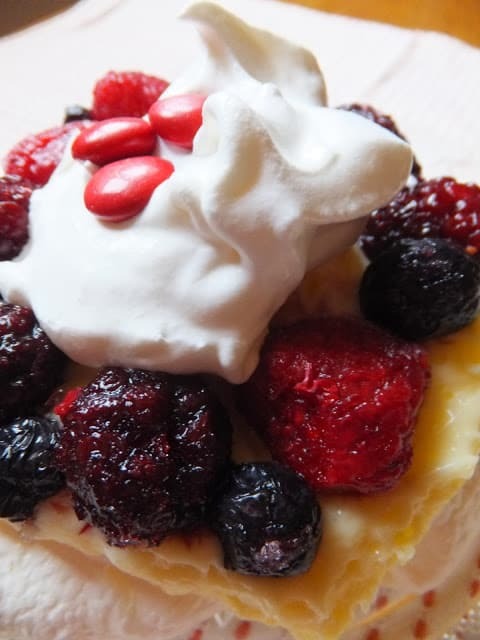 Schaumtorten or Schaum Torte [SHOWM tohrt] is a classic dessert from Austria consists of baked meringue layers filled with fruit and whipped cream. Schaum Torte is a very popular dessert served here in Wisconsin, usually during the holidays. Wisconsin has a large German ancestry population which accounts for this. Along with the fact that we love our sweets and Schaum Torte is delicious. It’s one of the few “classic” desserts I’ve yet to make. I’m hoping to change that fact..someday. Place egg whites in a small bowl, let stand at room temperature for 30 minutes. Meanwhile, make pudding according to package directions. Place in refrigerator until needed. Add cream of tartar and salt to egg whites. Beat on medium speed until soft peaks form. Gradually beat in sugar, 1 tablespoon at a time, on high until stiff peaks form. Beat in vanilla extract. Drop meringue into two mounds on parchment lined baking sheet. Shape into 3-1/2 inch cups with the back of a spoon. Bake at 225º for 1 to 1-1/4 hours or until set and dry. Turn oven off. Leave meringues in oven for 1 hour. Remove to wire racks to cool. In a small bowl, combine thawed berries and sugar. Let stand 5 minutes. 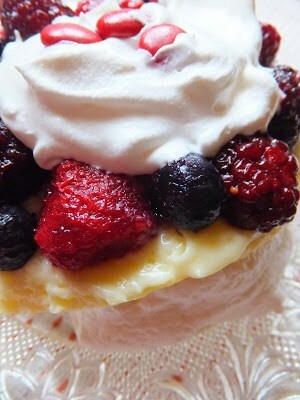 Spoon pudding into cooled meringue shells, top with berries, top berries with thawed whipped topping. Garnish with candies. *Recipe Note: Once assembled, serve immediately. What a special Valentine Treat, we would just love your Berries on A Cloud. Hope you are having a great week and thanks so much for sharing with Full Plate Thursday! This sounds incredible! Thanks for sharing on the weekend re-Treat Link Party! Coming from Full Plate Thursday. Come-by and visit my blog.